Cut cherry tomatoes in half and sautee in olive oil for 5 minutes at medium heat. Add garlic and after a minute add mushrooms. Cook for additional five minutes and toss in the baby spinach. Turn off heat and let spinach wilt. 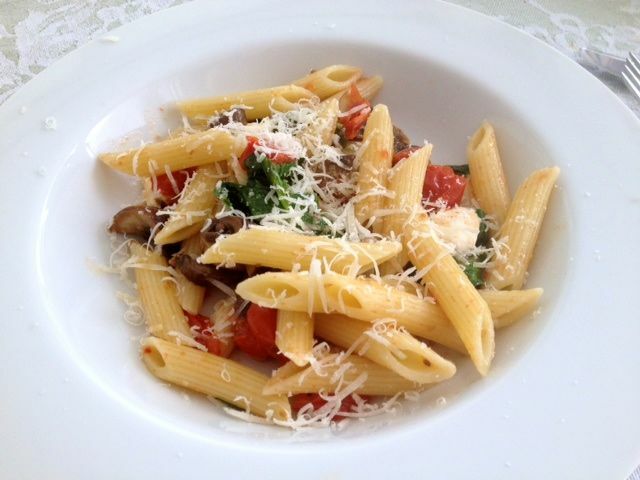 Once ready, add bits of mozzarella to the strained pasta and mix with the vegetables. Sprinkle with Parmesan cheese.